Born in Bilefeld in 1981. 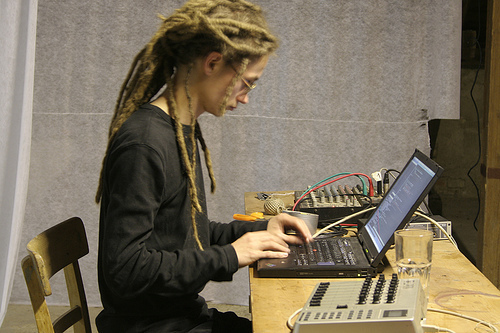 Studied studies of physics & computer sciences, universities of Tübingen and Stuttgart in 2001- 2004; studies of electroacoustic music at Institute for computer based music and electronic media with Wolfgang Musil; since 2005 studies of computer sciences at Vienna univerity of technology and since 2007 studies of digital arts at University of applied arts. In music he mostly works as an improvisor with laptop. He has regular duos with Klaus Filip (Taus), with Seijrio Murayama and with Manuel Knapp. Between 2004-2005 he was curator of the concert series “Plattform für freie musik” at Fluctuating images, Stuttgart, now run by Oliver Prechtl. He runs a cd-r/ web label Moka bar.